The Inner Temple, though not a corporation, uses an armorial device, Azure a pegasus salient argent. This ancient usage was confirmed in 1967 by the College of Arms. The Inner Temple pegasus is first mentioned in Gerard Legh’s account of the Christmas revels of 1561, when Robert Dudley (favourite of Queen Elizabeth I) acted the principal part of Prince Pallaphilos, constable-marshal of the Inner Temple, and patron of the Honourable Order of Pegasus. It has been suggested that the choice of pegasus reflected Dudley’s real-life office of Master of the Horse. Alternatively, it may have resulted from a misinterpretation of ancient tiles in Temple Church showing a knight on horseback with a shield barry; these tiles alternated with the Paschal lamb and flag of the knights Templar, which was adopted as the emblem of the Middle Temple. 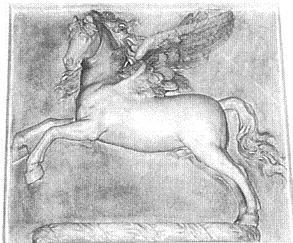 Representations of the flying horse were thereafter widely used on the Inn’s property, sometimes as a badge or crest, sometimes borne on a shield. In 1709 Sir James Thornhill painted an allegorical scene at the east end of the Hall showing Pegasus rising from Mount Helicon. Various other representations are to be found throughout the Inn.